Since 2003, Healthy NewsWorks has been empowering student journalists in third to eighth grades to promote health and literacy in their school communities. In 2016-17, more than 400 students in 15 schools worked on newspapers which were distributed to more than 6,500 children and their families. Healthy NewsWorks reinforces Pennsylvania literacy standards, and student journalists develop writing, reading, research and critical thinking skills. Healthy NewsWorks was the recipient of a public health award in May, 2016 from the College of Physicians of Philadelphia, one of the nation’s oldest professional medical associations. Healthy NewsWorks was chosen “for its work to promote health and literacy by engaging elementary and middle school students to address intellectually and creatively the health issues that confront their generation,” according to the award plaque. The College of Physicians of Philadelphia selected Moriah Hall, MPH, a member of the Healthy NewsWorks Advisory Board, to deliver a presentation on how the Healthy NewsWorks program assesses its impact on student journalists, other students, and community members. The presentation, titled “Telling the Story of Healthy NewsWorks: Exploring Methods to Evaluate Program Impact,” was part of the College’s Section on Public Health and Preventive Medicine, Public Health Day Symposium held in April 2014. The American Medical Association Foundation awarded Healthy NewsWorks a grant in 2012 that enabled student journalists to write about prescription drug safety and schools to host poster contests to heighen awareness about this important issue. 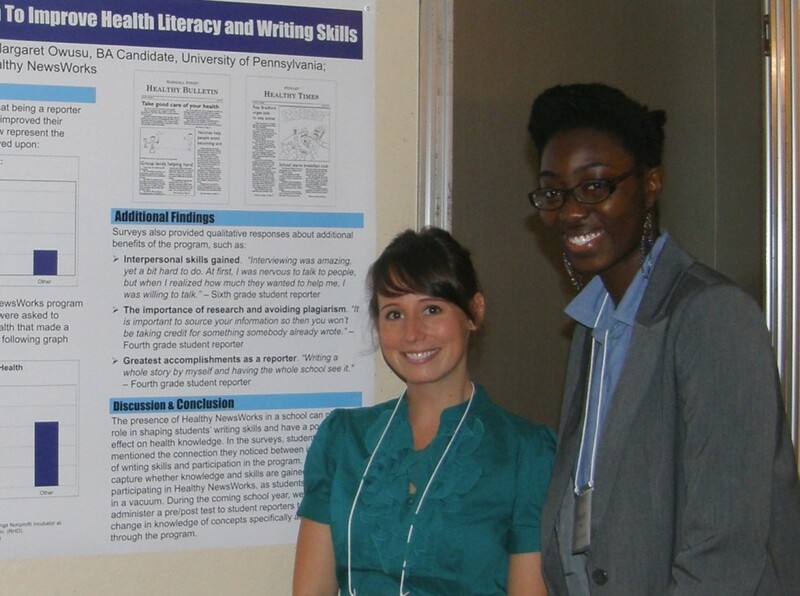 The Pennsylvania Public Health Association accepted a Healthy NewsWorks abstract for a poster presentation at its annual conference in Sept. 2011. Student journalists covered the American Public Health Association annual convention and Moving Philadelphia, a conference hosted by the Jefferson School of Population Health, during the 2009-2010 school year. The Centers for Disease Control and Prevention invited five students from the program to cover the national Weight of the Nation Conference in Washington, DC, in July 2009. The American Public Health Association accepted a Healthy NewsWorks research abstract for an oral presentation at the 2009 annual convention. The Keystone Health Promotion Conference in June 2009 invited Nancy Erickson, a school nurse, and program director Marian Uhlman to discuss the Healthy NewsWorks program as a promising practice.